It’s not exactly news that soup is good for you, but this one soup—served cold—should be in your diet, if it isn’t already. A new study says gazpacho, a delicious staple of southern Spanish cuisine, can help reduce high blood pressure. Hypertension affects one-quarter of all American adults. Exercise and diet play key roles in prevention and treatment. The recent study examined nearly 4,000 people, and monitored gazpacho consumption. 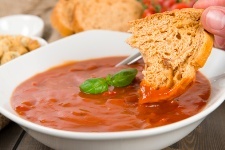 The soup contains ingredients such as olive oil, garlic, and tomatoes, each of which has natural chemicals that reduce pressure on blood vessels. The new study shows for the first time that gazpacho could be as beneficial as the ingredients it contains. It was not expected that gazpacho would have this much of an effect because one of its core ingredients is salt. Sodium tends to raise blood pressure. Still, it seems the flood of healthy ingredients offsets the salt problem, and in fact, overcomes it. The researchers report that gazpacho could reduce blood pressure by up to 27%. The key ingredients are believed to be vitamin C, carotenoids, and polyphenols. The last two are plant-based chemicals that exert powerful healthy effects. So, the next time you are selecting soup options, give this cold one a thought. And, if you can make it from home, you can better control the salt as well. Without the additional salt, it could potentially drop your blood pressure even further. Medina-Remon, A, et al., “Gazpacho consumption is associated with lower blood pressure and reduced hypertension in a high cardiovascular risk cohort. Cross-sectional study of the PREDIMED trial,” Nutrition, Metabolism & Cardiovascular Diseases, published online November 28, 2012.